Television presenter Des O'Connor and EastEnders star June Brown are among the showbusiness names recognised in the Queen's Birthday Honours list. Other awards go to Victoria Wood, Paul O'Grady, and Russell T Davies - the man who brought Doctor Who back to life. 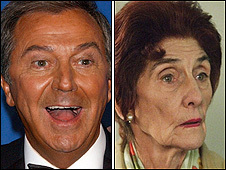 June Brown - better known as Dot Cotton - becomes an MBE, while Countdown host Des O'Connor is appointed CBE. The 76-year-old star said he was "delighted", but confessed: "I haven't done a day's work in my life." O'Connor has been a mainstay of Britain's entertainment industry since he landed his own TV series 45 years ago. The comedian, whose shows have included Des O'Connor Tonight, Take Your Pick, and Today With Des And Mel, said: "I just wish my mum and dad were still here to see it. "I was born in the East End of London to a working class family and they would have been elated. "It's a great plus... I haven't done a day's work in my life. I've done a day's effort but not work, because it's something I love. "I like to think that if something comes your way like this it's some kind of public recognition. It's a very nice thing to happen in your life." June Brown, who has had two stints as busybody chain smoker Dot Cotton on EastEnders, was recommended for her honour by fellow cast member Leslie Grantham. The 81-year-old said it was "lovely" to be joining fellow EastEnders stars Barbara Windsor and Wendy Richard, who have previously received honours. Brown told BBC London News that she almost missed out on receiving her honour. She said: "It all went a bit wrong, because they got the wrong address and it was all last-minute and I thought the investiture was today. I was quite confused, so I rushed out and bought a suit." 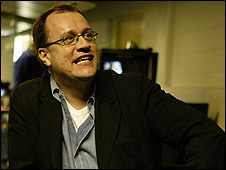 Swansea-born writer Russell T Davies, 45, revived Doctor Who in 2005 - and it has now become the centrepiece of BBC One's Saturday schedule. He said of his OBE: "I'm delighted to accept, and I hope it does the whole industry a bit of good, for the writing of television drama to be recognised." Davies, who also created the controversial Channel 4 drama Queer As Folk, announced earlier this year he will be stepping down from Doctor Who after a series of special episodes in 2009. A BBC spokesman said: "We are delighted for Russell - he is one of this country's greatest writers and it is fantastic that his talent has been recognised in this way." Victoria Wood, who began her career on ITV talent show New Faces, is appointed CBE in the honours list. The 55-year-old comedienne became a household name with her BBC sketch show Victoria Wood As Seen On TV and has gone on to create sitcom Dinner Ladies and West End Musical Acorn Antiques. 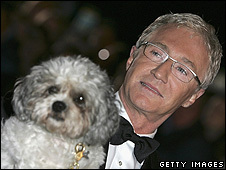 Paul O'Grady received news of his MBE on his 53rd birthday. The Channel 4 star, who rose to fame with his brash and brassy alter-ego Lily Savage, said: "I thought it was a wind-up. "I'm the last person, I'd have thought, who would be given an MBE," he continued. "What have I done to deserve it? I've just sat there night after night banging out telly." The chat show host added that the last time he met the Queen was at a Royal Variety performance when he was "blowing a trumpet with my head between my legs". "She was very nice," he added. Other showbusiness names honoured include actor Chiwetel Ejiofor - who has appeared in Inside Man, Love Actually and American Gangster - and Rising Damp star Don Warrington. Both are appointed OBE.